Ingredients for cooking Scrambled Eggs Scrambled eggs are one of those deceptive dishes - apparently simple, but with a huge difference between getting it right, and not! The trick with cooking eggs, generally, it that they should not get too hot - so that the white cooks through, while the yolk is barely done. Making sure that plenty of air gets beaten in, too. The quality of the eggs makes a big difference. 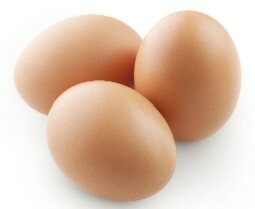 Try and get the best, free-range, organic eggs you can find. I like to use a lightweight saucepan - thin metal - so that the eggs stop cooking as soon as the pan is removed from the heat. Also, I use a wooden fork (rather than a spoon or spatula) for beating the eggs. Put a splash of milk in a saucepan, with a little salt and plenty of finely-ground black pepper. Crack three eggs into the pan, and add a couple of ounces of grated cheese. Stir gently. If you prefer your eggs without cheese, then a ounce of butter should be used instead. Since you've probably just taken eggs, cheese and milk out of the fridge, they're likely to be a bit too cold. Leave the pan for ten of fifteen minutes to approach room temperature. Put the pan on the stove, at the lowest possible heat. Stir vigorously, breaking the egg yolks, until the cheese has melted and the whole lot has become homogeneous. (Good word, huh?) Then, increase the heat, continuing to stir all the time, until the eggs start setting. Make sure the sides of the pan are scraped regularly as you stir. Serve on toast, immediately. You can accompany the eggs with crispy bacon, cooked on the griddle, or for special occasions, a little smoked salmon garnished with caviare.